(NT 41224 67717) Ormiston Hall: The NE structure is 17th c in date. It is L-shaped on plan with the re-entrant angle facing S. The larger wing on the NE is 47 1/4' x 25 3/4' externally; the shorter wing projects 20' from the lateral wall and is 27' wide. Adjoining the lesser wing and communicating with it is another structure. 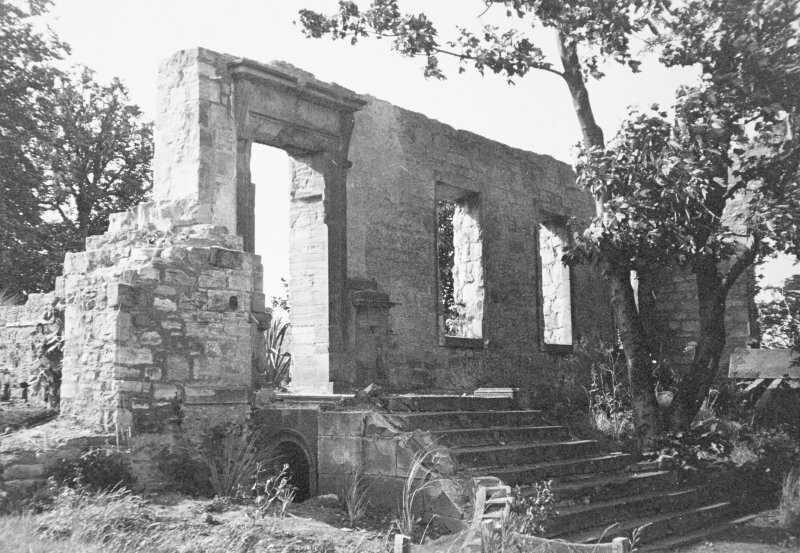 Ormiston Hall is now in ruins, having been burnt down during the Second World War. The E walls remain to a height of about 9.0m and the W walls to 1.0m. Some of the walling and windows have been restored and the whole is incorporated within a private garden. Ormiston Hall: Only some fragments of two successive houses. First the Hall, built for John Cockburn of Ormiston by John Baxter, mason, in 1745-8, extended by Alexander Steven and George Tod for the Earl of Hopetoun in 1772, and further enlarged in the early 19th century. Of this there is only a doorpiece and three ground-floor bays, with a projecting section of five bays to the right. Beside it, a zigzag wall with slits at the angles, probably a screen to a laundry yard in which clothes were dried. Then the old Ormiston House of which a part has been incorporated in the office courtyard nearby. This includes vaulted cellars and an arched and roll-moulded doorway. Additions at Ormiston Hall. Built by Alexander Stevens and George Tod, masons, 1772-1776. Measurement by Robert Burn, Architect, Edinburgh, 18th June.